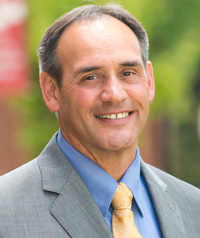 Dr. Gene Pfeifer is the tenth president of Bethany Lutheran College taking on the role in July 2015. Pfeifer earned a bachelor’s degree from Martin Luther College (MLC), a master of science in education from The University of Wisconsin - Whitewater, and a doctor of philosophy in education, curriculum and instruction from the University of Minnesota. Pfeifer is married to Carrie Pfeifer, who holds a doctor of education with special education focus from Nova Southeastern University. She is also a faculty member at Bethany serving as a full-time associate professor in the Education Department, and the Learning Disabilities Coordinator. Prior to assuming the presidency at Bethany, Pfeifer was President of St. Croix Lutheran Grades 6-12 in West St. Paul, Minnesota. Pfeifer also served as Professor of Education and Director of Clinical Experiences at Martin Luther College (MLC) from 1993 until 2007. Under Pfeifer’s leadership, St. Croix saw significant growth in both traditional and international enrollment numbers, and the campus of the private, Christian, college preparatory school expanded in size.